Upload Selected Products: Uploads all the selected products on Newegg.com. Image Update: Updates the images of the selected products on Newegg.com. 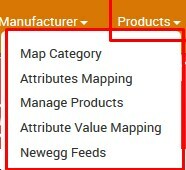 Delete Selected Products: Deletes the selected products from Newegg.com. Sync Selected Products: Synchronize the product details of the selected products from the BigCommerce store to App. In the select bulk action list, select Upload Selected Product. If the product has all the valid information, then it gets uploaded o Newegg.com and the UPLOAD STATUS changes from ACTIVATED to SUBMITTED. Otherwise, the exclamation mark icon, which actually signifies the ERROR icon, appears in the corresponding ACTION column.